Are regional and seasonal averages from only a few satellite measurements, all aligned along a specific path, representative? Probably not. We present a method to adjust for the so-called sampling bias and investigate its influence on derived long-term trends. The method is illustrated and validated for a long-lived trace gas (carbonyl sulfide), and it is shown that the influence of the sampling bias is too small to change scientific conclusions on long-term trends. 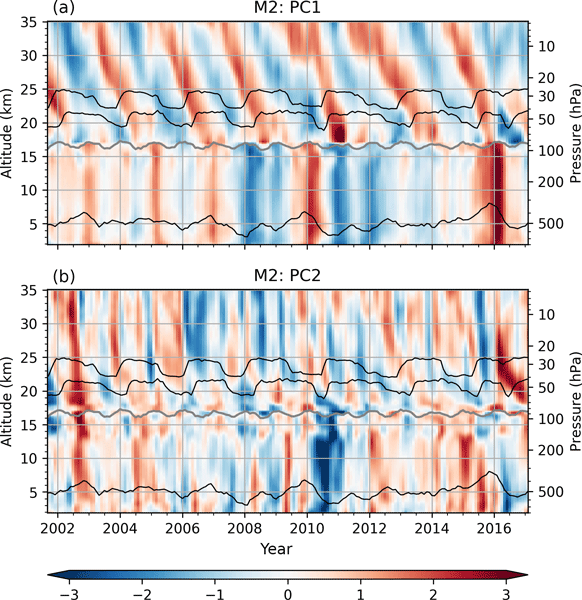 In this paper, for the first time, absolute gravity wave momentum flux (GWMF) on temporal scales from terannual variation up to solar cycle length are investigated. The systematic spectral analysis of SABER absolute GWMF are presented and physically interpreted. The various role of filtering and oblique propagating is discussed which is likely an important factor for MLT dynamics, and hence can be used as a stringent test bed of the reproduction of such features in global models. We present a study based on GLORIA aircraft and MLS/ACE-FTS/CALIOP satellite measurements during the Arctic winter 2015/16, which demonstrate (for the Arctic) unusual chlorine deactivation preferably into HCl instead of ClONO2 due to low ozone abundances in the lowermost stratosphere with a focus at 380 K potential temperature. 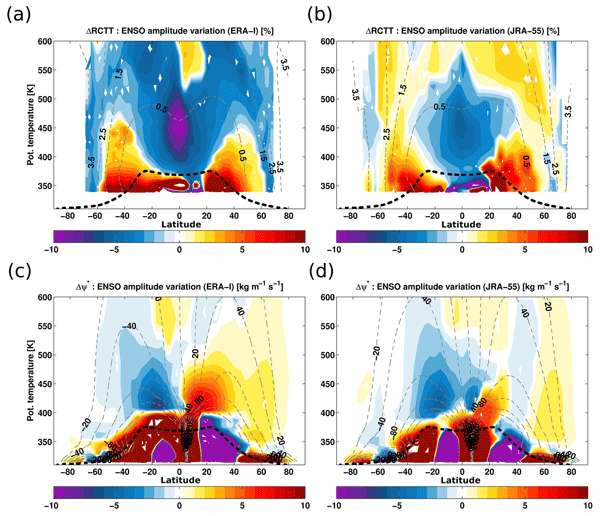 Atmospheric models CLaMS and EMAC are evaluated, and measured ClONO2 is linked with transport and in-situ deactivation in the lowermost stratosphere. We present Lagrangian simulations of polar stratospheric clouds (PSCs) for the Arctic winter 2009/2010 and the Antarctic winter 2011 using the Chemical Lagrangian Model of the Stratosphere (CLaMS). The paper comprises a detailed model description with ice PSCs and related dehydration being the focus of this study. Comparisons between our simulations and observations from different satellites on season-long and vortex-wide scales as well as for single PSC events show an overall good agreement. 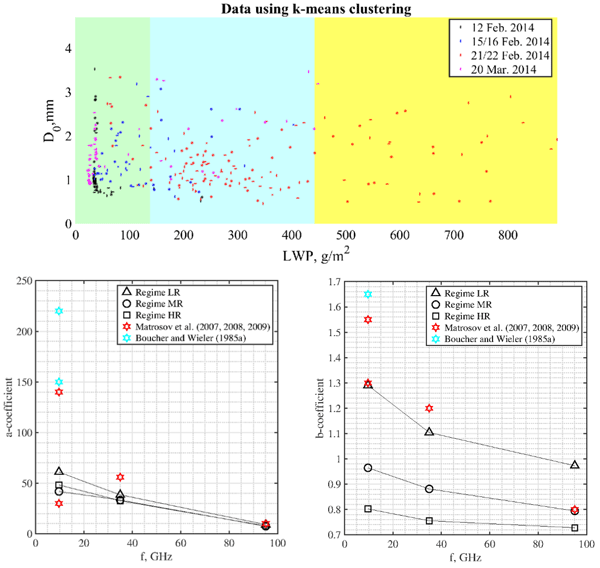 Balloon-borne measurements performed over Lhasa in August 2013 are investigated using CLaMS trajectory calculations. Here, we focus on high ozone mixing ratios in the free troposphere. 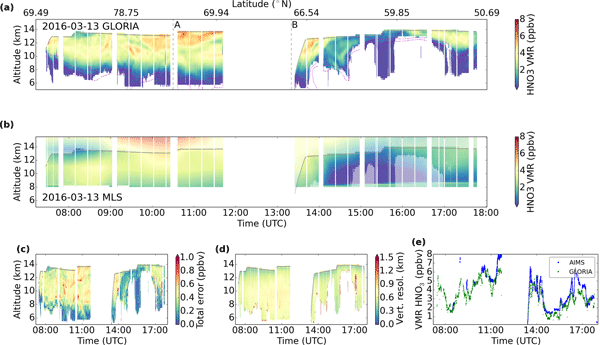 Our findings demonstrate that both stratospheric intrusions and convective transport of air pollution play a major role in enhancing middle and upper tropospheric ozone. 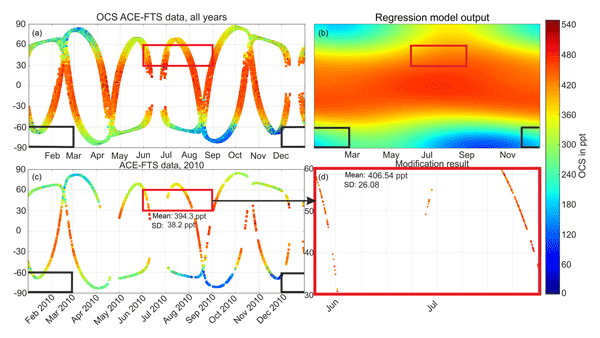 The unprecedented timing of an El Niño event aligned with the disrupted QBO in 2015–2016 caused a perturbation to the stratospheric circulation, affecting trace gases. 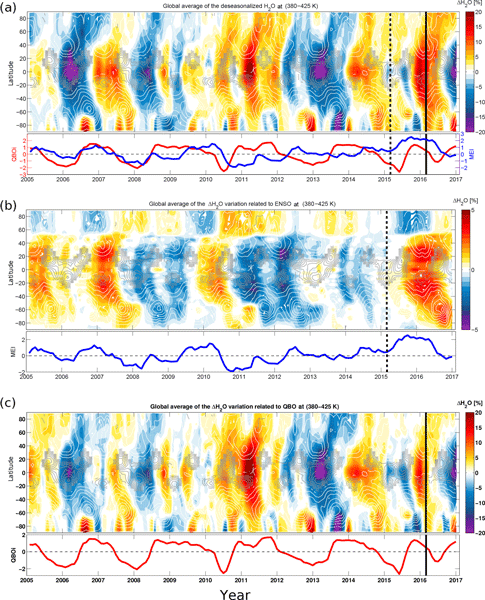 This paper resolves the puzzling response of the lower stratospheric water vapor by showing that the QBO disruption reversed the lower stratosphere moistening triggered by the alignment of the El Niño event with a westerly QBO in early boreal winter. 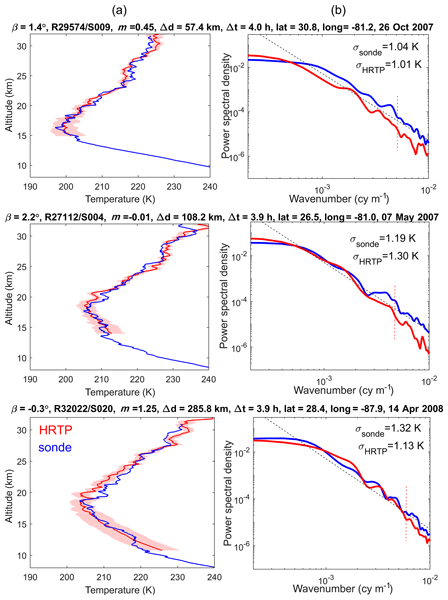 We present two-dimensional cross sections of temperature, HNO3, O3, ClONO2, H2O and CFC-12 from measurements of the GLORIA infrared limb imager during the POLSTRACC/GW-LCYCLE/SALSA aircraft campaigns in the Arctic winter 2015/2016. GLORIA sounded the atmosphere between 5 and 14 km with vertical resolutions of 0.4–1 km. Estimated errors are in the range of 1–2 K (temperature) and 10 %–20 % (trace gases). Comparisons to in situ instruments onboard the aircraft and to Aura/MLS are shown. We are interested to study the transport pathway of air masses from the region of the Asian monsoon into the stratosphere because this region is very sensitive for climate change. Our findings show that this transport occurs in three distinct steps. The ice water content (IWC) of cirrus clouds is an essential parameter that determines their radiative properties and is thus important for climate simulations. Experimental investigations of IWCs measured on board research aircraft reveal that their accuracy is influenced by the sampling position. IWCs detected at the aircraft roof deviate significantly from wing, side or bottom IWCs. The reasons are deflections of the gas streamlines and ice particle trajectories behind the aircraft cockpit. The concept and optical layout of a limb sounder using a spatial heterodyne spectrometer is presented. The instrument fits onto a nano-satellite platform, such as a CubeSat. It is designed for the derivation of temperatures in the mesosphere and lower thermosphere. 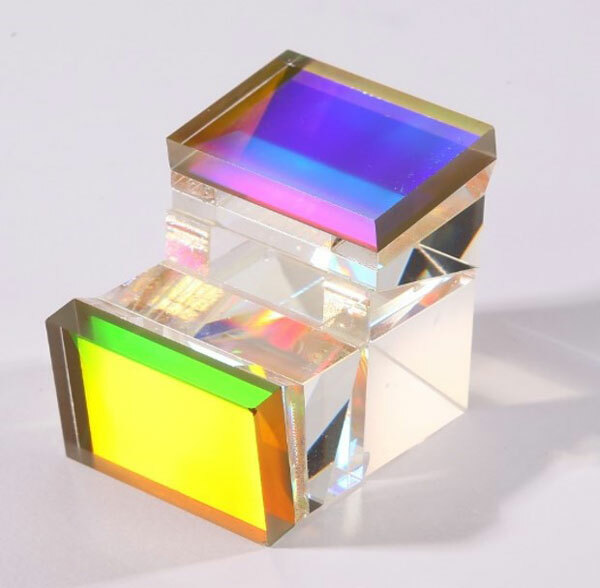 The design parameters of the optics and a radiometric assessment of the instrument as well as the main characterization and calibration steps are discussed. Water vapour (H2O) in the UTLS is a key player for global radiation, which is critical for predictions of future climate change. We investigate the effects of current uncertainties in tropopause temperature, horizontal transport and small-scale mixing on simulated H2O, using the Chemical Lagrangian Model of the Stratosphere. Our sensitivity studies provide new insights into the leading processes controlling stratospheric H2O, important for assessing and improving climate model projections. Many works investigate the impact of ENSO on the troposphere. However, only a few works check the impact of ENSO at higher altitudes. Here, we analyse the impact of ENSO on the vicinity of the tropopause using reanalysis, satellite, in situ and model data. We find that ENSO shows the strongest signal in winter, but its impact can last until early the next summer. The ENSO anomaly is insignificant in late summer. Our study can help to understand the atmosphere propagation after ENSO. 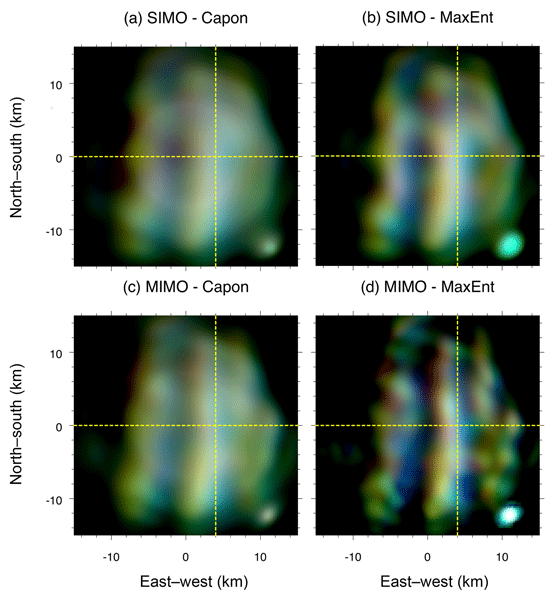 In this paper, we propose a new observation strategy, called sweep mode , for a real three-dimensional tomographic reconstruction of gravity waves in the mesosphere and lower thermosphere by modifying the observation geometry of conventional limb-sounding measurements. It enhances the horizontal resolution that typical limb sounders can achieve while at the same time retaining the good vertical resolution they have. The gravity wave climatology based on atmospheric infrared limb emissions observed by satellite (GRACILE) is a global data set of gravity wave (GW) distributions in the stratosphere and the mesosphere observed by the infrared limb sounding satellite instruments HIRDLS and SABER. Typical distributions of multiple GW parameters are provided. Possible applications are scientific studies, comparison with other observations, or comparison with resolved or parametrized GW distributions in models. The Asian monsoon is a pronounced circulation system linked to rapid vertical transport of surface air from India and east Asia in the summer months. We found, based on aircraft measurements, higher concentration of water vapor in the lowermost stratosphere caused by the Asian monsoon. 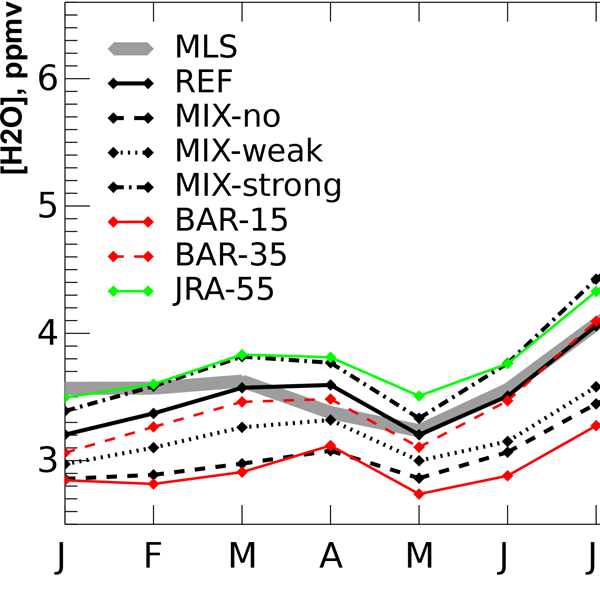 Enrichment of water vapor concentrations in the lowermost stratosphere impacts the radiation budget and thus climate. Understanding those variations in water vapor is important for climate projections. Gravity waves (GWs) play an important role in atmospheric dynamics. 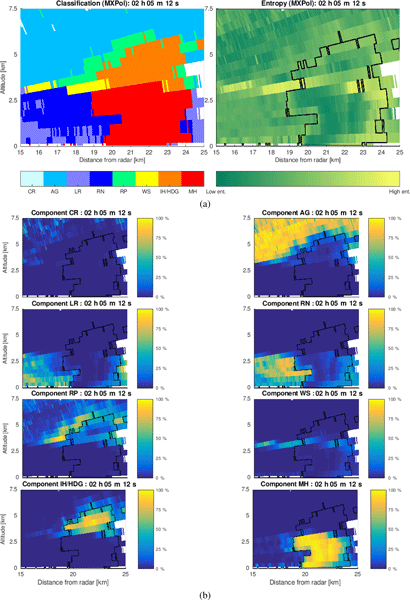 In this work, we propose a new observation strategy for GWs in the mesopause region by combining limb and sub-limb satellite-borne remote sensing measurements for improving the spatial resolution of temperatures that are retrieved from atmospheric soundings. It shows that one major advantage of this observation strategy is that much smaller-scale GWs can be observed. The discrepancy between modelled and observed 25-year trends of the strength of the stratospheric Brewer–Dobson circulation (BDC) is still not resolved. With our paper we trace the observed hemispheric dipole structure of age of air trends back to natural variability in shorter-term (decadal) time frames. Beyond this we demonstrate that after correction for the decadal natural variability the remaining trend for the first decade of the 21st century is consistent with model simulations. Pollution transport from the surface to the stratosphere within the Asian summer monsoon circulation may cause harmful effects on stratospheric chemistry and climate. 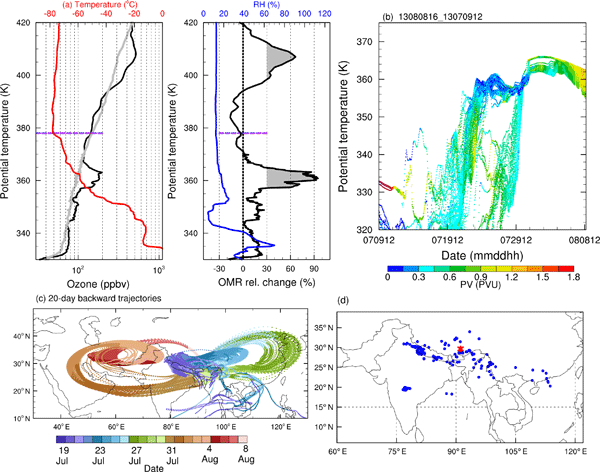 We investigate air mass transport from the monsoon anticyclone into the stratosphere, combining model simulations with satellite trace gas measurements. 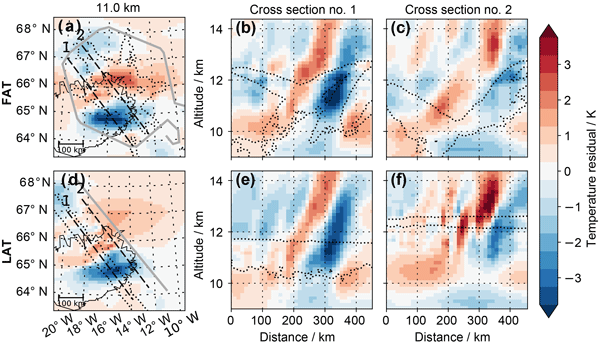 We show evidence for two transport pathways from the monsoon: (i) into the tropical stratosphere and (ii) into the Northern Hemisphere extratropical lower stratosphere. 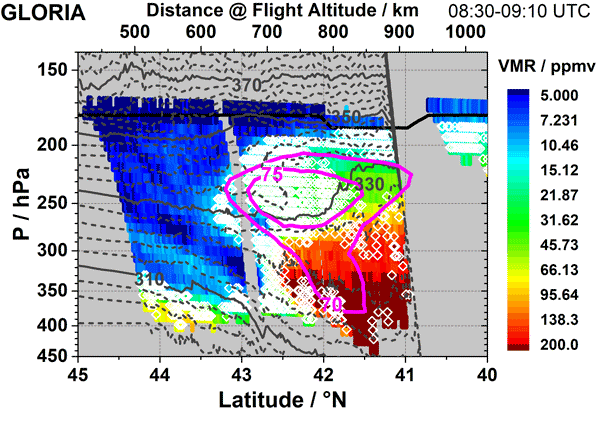 The potential for chemical state analysis at tropopause heights was investigated by combining airborne tomographic observations with a chemical data-assimilation system in form of a case study. Related developments include the use of potential vorticity for ozone initialization and flow-dependent horizontal correlations. This setup demonstrated substantial improvements in terms of spatial extend and alignment of atmospheric structures down to filamentary foldings along airmass boundaries. The identification of transport pathways from the Asian monsoon anticyclone into the lower stratosphere is unclear. 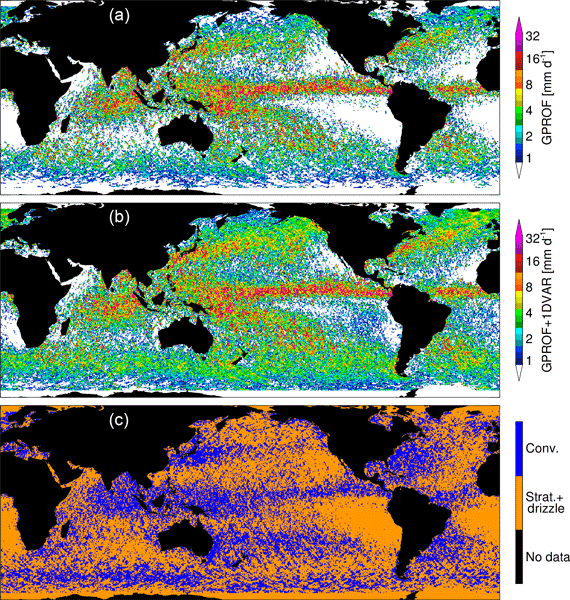 Global simulations with the CLaMS model demonstrate that source regions in Asia and in the Pacific Ocean have a significant impact on the chemical composition of the lower stratosphere of the Northern Hemisphere by flooding the extratropical lower stratosphere with young moist air masses. 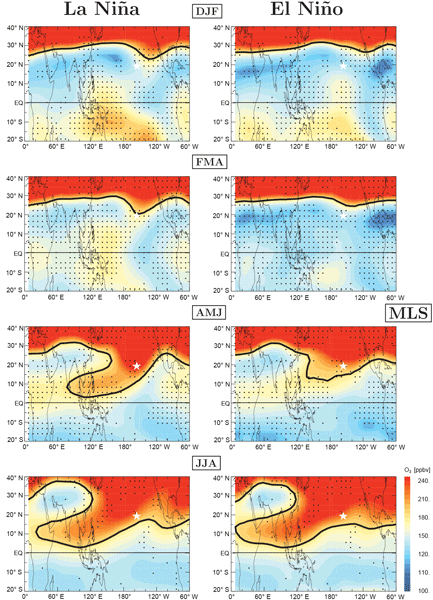 Two main horizontal transport pathways from the Asian monsoon anticyclone are identified. A new method for detecting aerosol in the UTLS based on infrared limb emission measurements is presented. The method was developed using radiative transfer simulations (including scattering) and Envisat MIPAS measurements. 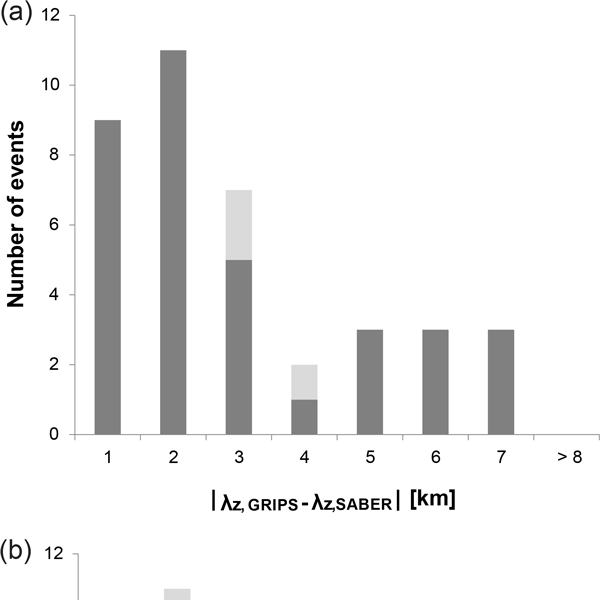 Results are presented for volcanic ash and sulfate aerosol originating from the Grimsvötn (Iceland), Puyehue–Cordon Caulle (Chile), and Nabro (Eritrea) eruptions in 2011 and compared with AIRS volcanic ash and SO2 measurements. In situ airborne measurements performed during TACTS/ESMVal 2012 were analysed to investigate the chemical compostion of the upper troposphere and lower stratosphere. 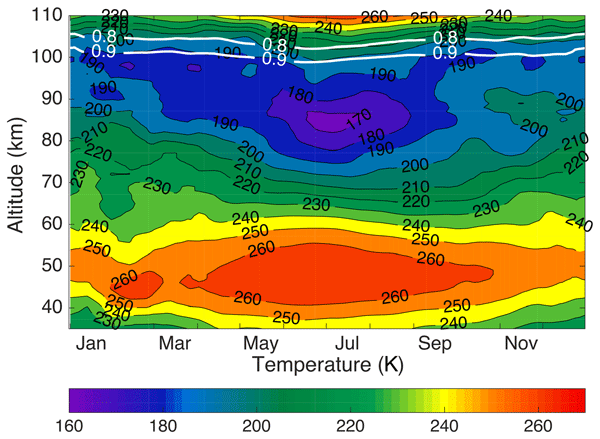 N2O, CO and O3 data show an increase in tropospherically affected air masses within the extratropical stratosphere from August to September 2012, which originate from the Asian monsoon region. Thus, the Asian monsoon anticyclone significantly affected the chemical composition of the extratropical stratosphere during summer 2012. We present a new classification approach for different polar stratospheric cloud types. The so-called Bayesian classifier estimates the most likely probability that one of the three PSC types (ice, NAT, or STS) dominates the characteristics of a measured infrared spectrum. The entire measurement period of the satellite instrument MIPAS from July 2002 to April 2013 is processed using the new classifier. This paper presents an analysis of temperature and the trace gases PAN and O3 in the Asian Summer Monsoon (ASM) region. The positive PAN anomaly consisting of polluted air is confined vertically within the main ASM anticyclone, whereas a recently shed eddy exhibits enhanced PAN VMRs for 1 to 2 km above the thermal tropopause. This implies that eddy shedding provides a very rapid horizontal transport pathway of Asian pollution into the extratropical lowermost stratosphere. Convection is an important source of atmospheric gravity waves (GWs). 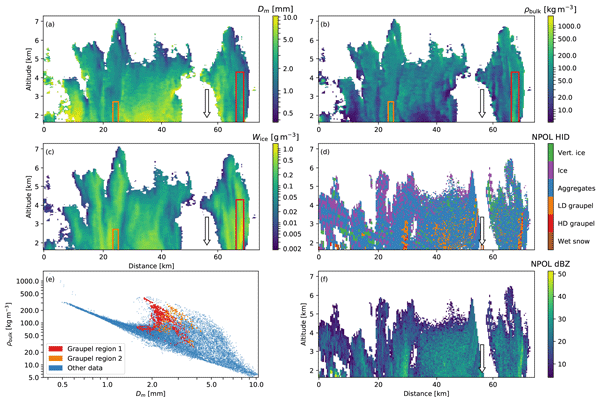 In this work, scales of convective GWs seen by limb sounders were first defined based on observed spectral information. Interactions of these waves with the background were considered. Long-scale convective GWs addressed by this approach showed significant importance in driving the QBO. Zonal mean of GW momentum flux and its vertical gradients are in good agreement with respective observations provided by limb sounders. The Asian summer monsoon circulation is an important global circulation system associated with strong upward transport of tropospheric source gases. We show that the contribution of different boundary source regions to the Asian monsoon anticyclone strongly depends on its intra-seasonal variability and that emissions from Asia have a significant impact on the chemical compositions of the lowermost stratosphere of the Northern Hemisphere at the end of the monsoon season in Sep./Oct. 2012. A remarkable major stratospheric sudden warming during the boreal winter 2008/09 is studied with the Chemical Lagrangian Model of the Stratosphere (CLaMS). We investigate how mixing triggered by this event correlates the wave forcing and how transport and mixing affect the composition of the whole stratosphere in the Northern Hemisphere, by using the tracer-tracer correlation technique. The plane-carried Gimballed Limb Observer for Radiance Imaging of the Atmosphere (GLORIA) measures the thermal radiation emitted by gases and particles in the atmosphere, in a height range of about 5-20 km. In between these measurements, GLORIA is pointed at known radiation sources for calibration. Noise in these calibration measurements can lead to artefacts in the final products. In this paper, we present new techniques which exploit GLORIA's imaging capabilities to reduce these noise effects. The GLORIA sounder is an airborne infrared limb-imager combining a two-dimensional infrared detector with a Fourier transform spectrometer. It was operated aboard the new German Gulfstream G550 research aircraft HALO during the TACTS and ESMVAL campaigns in summer 2012. 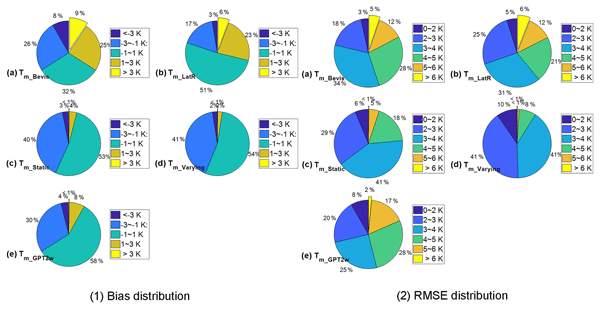 This paper describes the retrieval of temperature, as well as H2O, HNO3, and O3 cross sections from GLORIA dynamics mode spectra. A high correlation is achieved between the remote sensing and the in situ trace gas measurements. 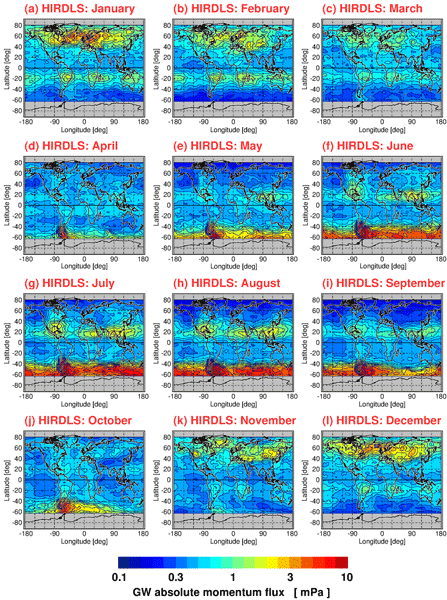 The forcings of the semiannual oscillation (SAO) of the tropical zonal wind in the stratopause region are investigated based on ERA-Interim reanalysis and HIRDLS satellite observations. In particular, the SAO driving by mesoscale gravity waves is estimated directly from satellite observations of gravity waves. Our study confirms previous indirect evidence that planetary waves dominate during the westward driving of the SAO, while gravity waves mainly provide eastward forcing. A version of the chemical transport model CLaMS is presented, which features a simplified (numerically inexpensive) chemistry scheme. The model results using this version of CLaMS show a good representation of anomaly fields of CO, CH4, N2O, and CFC-11 in the lower stratosphere. 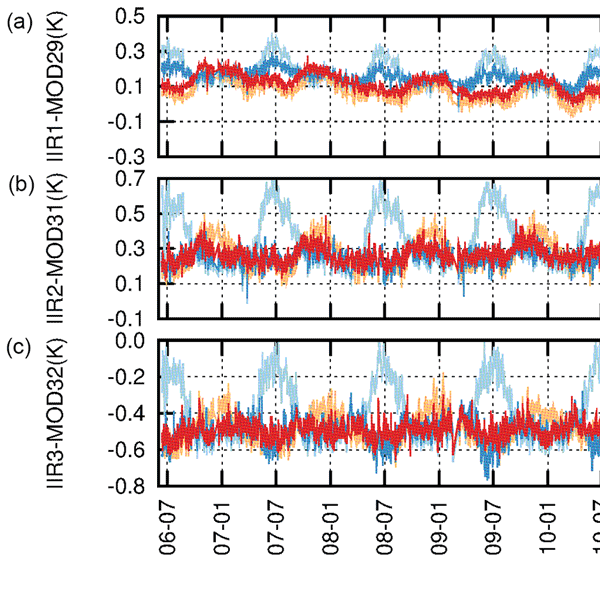 CO measurements of three instruments (COLD, HAGAR, and Falcon-CO) in the lower tropical stratosphere (during the campaign TROCCINOX in 2005) have been compared and show a good agreement within the error bars. This study investigated impacts of the selected radar volume coverage pattern, the sampling time period, the number of radars used, and the added value of advection correction on the retrieval of vertical air motion from a multi-Doppler-radar technique. 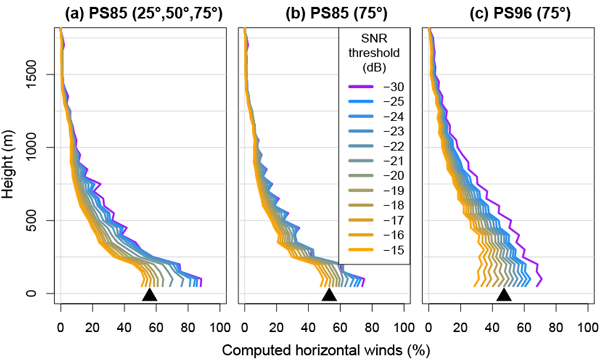 The results suggest that the use of rapid-scan radars can substantially improve the quality of wind retrievals and that the retrieved wind field needs to be carefully used considering the limitations of the radar observing system. Lidars are devices that can measure wind velocities remotely from the ground. Their estimates are very accurate in the mean but wind speed fluctuations lead to measurement errors. The presented data processing methods mitigate several of the error causes: first, by making use of knowledge about the mean wind direction and, second, by determining the location of air packages and sensing them in the best moment. Both methods can be applied to existing wind lidars and results are very promising. The delay of satellite signals from the Global Navigation Satellite System is valuable for numerical weather predictions, giving useful information about atmospheric constituents. These zenith total delay observations can help to better estimate the initial state of atmospheric analyses and to improve numerical weather forecasts. This study introduces the importance of GNSS zenith total delays, the detailed observation pre-processing method and weather forecast trials. 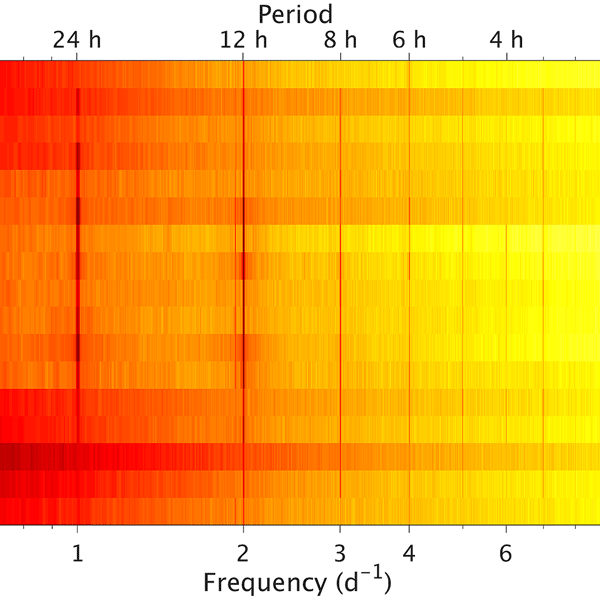 This study reports on the application of the FY3-C GNSS occultation sounder (GNOS) for assessing the global ionospheric response to magnetic storm events. We use the March 2015 magnetic storm event to demonstrate the reliability of NmF2 data derived from the instrument through comparisons with ground-based ionosonde observations. The analysis demonstrates the reliability of the GNSS radio occultation sounding instrument GNOS aboard the FY3-C satellite and validates its ionosphere products. A time-varying global gridded Ts–Tm model with 0.75 × 0.75 degree spatial resolution is developed in our study to precisely estimate water-vapor-weighted mean temperature Tm from surface air temperature Ts. Using multiple statistical tests, we assessed the Tm of our model and its impact on the GPS–PWV retrievals. Comparisons with other models demonstrate that our model has prominent advantages. Matlab codes and arrays used to realize our model are provided in the supplement of this study. 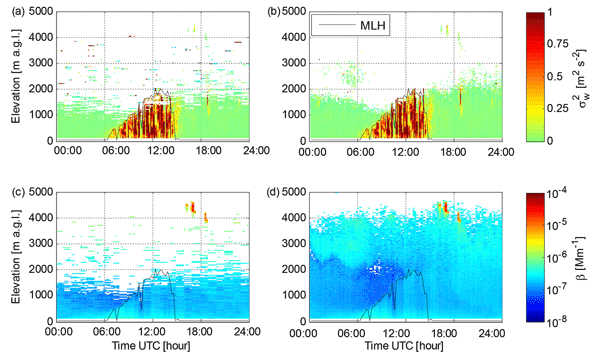 For decades, radar observations have been used to study complicated atmospheric dynamics. Previous observations of the mesosphere, between 80 and 90 km altitude, over polar regions have been limited to a spatial resolution of a few kilometers. In this work, we present a technique which allows 3-D radar observations of the mesospheric dynamics, with an unprecedented spatial resolution of ~ 900 m. We combine the concept of MIMO and high-resolution algorithms to improve the spatial resolution. 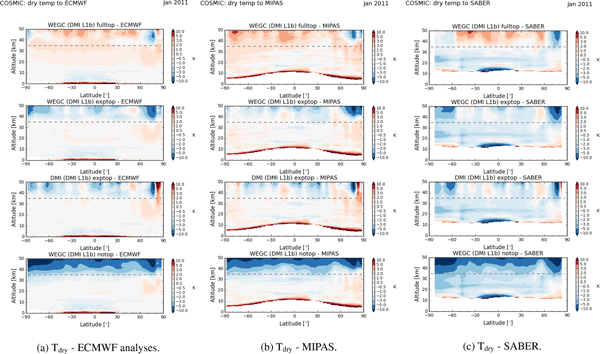 This paper presents a new dataset of temperature profiles in the upper stratosphere and mesosphere acquired with the GOMOS spectrometer on board the European satellite ENVISAT. The principle is to observe the scattering of sunlight by air molecules at the Earth limb. The observed signal is proportional to the atmospheric density from which the temperature is derived. This technique provides a new source of information on temperature where satellite observations are sparse. We use a near-infrared camera for the investigation of gravity waves. The camera observes the airglow layer, which is modulated by the gravity waves. The image processing, including the removal of the stars is explained. We describe the analysis with a 2D fast Fourier transform and automatic derivation of the wave parameters. The results show a clear seasonal and intra-diurnal variability, which is characterised in order to improve our understanding of gravity waves in the middle atmosphere. Assimilation of satellite navigation data into a popular weather model is yet another example of how to turn non-meteorological data into valuable information about the current state of the troposphere. Results show that observations from ground-based GPS receivers can improve humidity and rain forecasts in most severe weather events. It is another reason to extend the adoption of GPS data into weather forecasting across Europe. 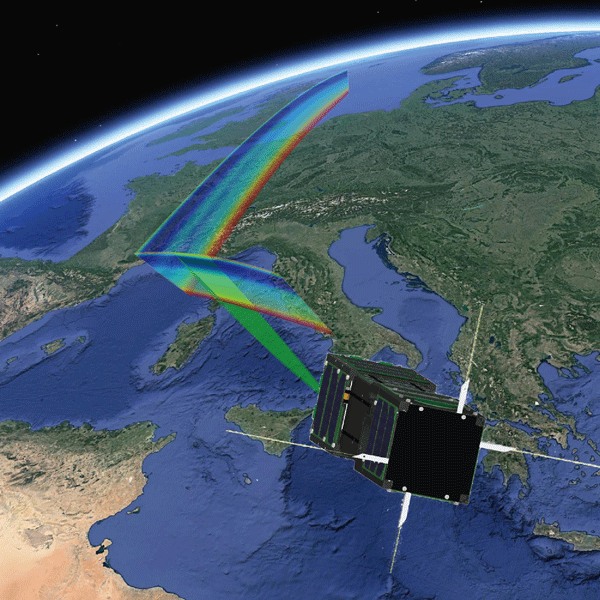 Imaging spectrometers provide valuable remote measurements of Earth's surface and atmosphere. 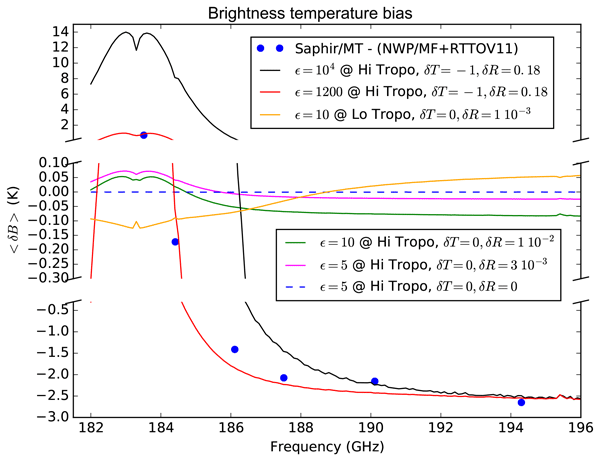 These measurements rely on computationally-expensive Radiative Transfer Models (RTMs). Spectrometers produce too much data to process with RTMs directly, requiring approximations that trade accuracy for speed. We demonstrate that neural networks can quickly emulate RTM calculations more accurately than current approaches, enabling the application of more sophisticated RTMs than current methods permit. 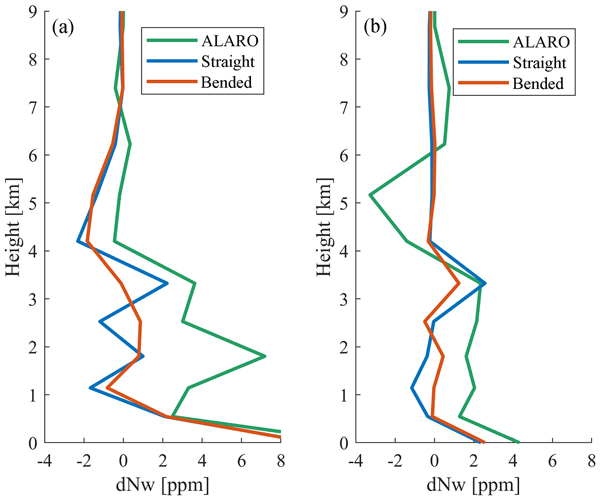 The paper describes a ray-tracing approach for the proper reconstruction of GNSS signal paths through the lower atmosphere, identifies possible error sources during ray tracing and provides a strategy for reducing their effect on the GNSS tomography solution, thereby contributing to a more reliable reconstruction of the 3-D water vapor distribution in the lower atmosphere from GNSS measurements. Can turbulence within the field of view cause significant biases in radiative transfer modeling at the 183 GHz band? The hypothesis whether turbulence within the passive microwave sounders field of view can cause significant biases in radiative transfer modelling at the 183 GHz water vapour absorption band is tested. It is shown that this effect can cause significant biases, which can match the observed ones by Brogniez et al. (2016). They can be explained by locating intense turbulence in the high troposphere, such as the one present in clear air turbulence, cumulus clouds or storms. In this paper we study the effect of different methods to derive the radial wind speed from a lidar Doppler spectrum. Numerical simulations and experimental results both indicate that the median method has slight improvements over the centroid method in terms of turbulent attenuation and also showed the lowest root mean squared error. Thus, when the aim is to reduce the volume averaging effect and obtain time series with a high temporal resolution, we recommend using the median method. We use 16 years of lidar (laser radar) temperature measurements of the middle atmosphere to form a climatology for use in studying atmospheric temperature change using an optimal estimation method (OEM). Using OEM allows us to calculate a complete systematic and random uncertainty budget and allows for an additional 10–15 km in altitude for the measurement to be used, improving our ability to detect atmospheric temperature change up to 100 km of altitude. The performance of the lidar measurements in comparison with radio soundings generally shows small RMSD (bias) for wind speed of around 1 m s−1 (0.1 m s−1) and for a wind direction of around 10° (1°). The post-processing of the non-motion-stabilized data shows comparably high quality to studies with motion stabilized systems. Ship-based doppler lidar measurements can contribute to filling the data gap over oceans, particularly in polar regions. 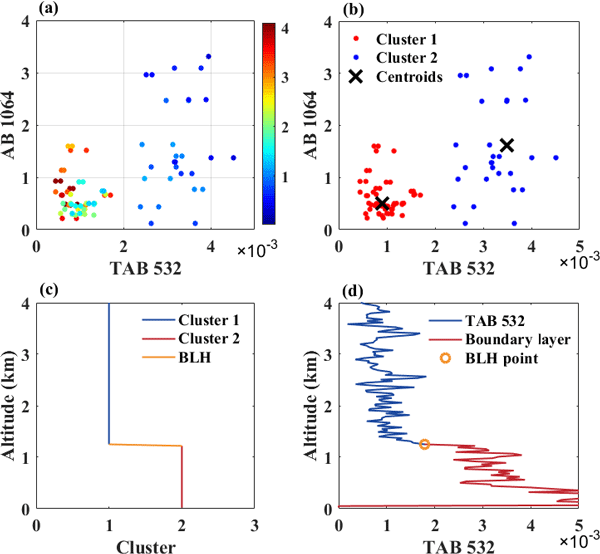 We developed a technique for inferring the physical properties (amount, size and density) of falling snow from radar observations made using multiple different frequencies. We tested this method using measurements from airborne radar and compared the results to direct measurements from another aircraft, as well as ground-based radar. The results demonstrate that multifrequency radars have significant advantages over those with a single frequency in determining the snow size and density. The paper aims at characterising and quantifying the spatio-temporal variability of the melting layer (ML; transition zone from solid to liquid precipitation). A method based on the Fourier transform is found to accurately describe different ML signatures. Hence, it is applied to characterise the ML variability in a relatively flat area and in an inner Alpine valley in Switzerland, where the variability at smaller spatial scales is found to be relatively more important. Recently a new approach for the production of RO climatologies has been proposed. The idea is to propagate mean bending angle profiles through processing and retrieve directly climatological products of refractivity, density, pressure, and temperature. The averaging suppresses noise in the data, allowing the bending angles to be used up to 80 km without the need for background information. This work focuses on the comparison of the new climatologies between two processing centers. 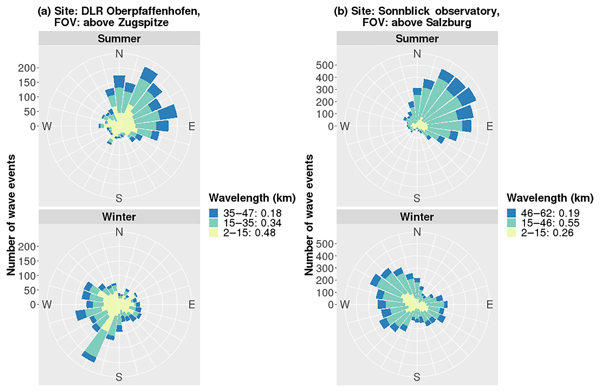 In this paper we propose an innovative approach for hydrometeor de-mixing, i.e., to identify and quantify the presence of mixtures of different hydrometeor types in a radar sampling volume. It is a bin-based approach, inspired by conventional decomposition methods and evaluated using C- and X-band radar measurements compared with synchronous ground observations. The paper also investigates the potential influence of incoherency in the backscattering from hydrometeor mixtures in a radar volume. Satellites are fairly good at detecting and quantifying rainfall over oceans, but the light rainfall characteristic of high latitudes and stratocumulus areas is harder to sense for passive sensors. The method presented extends the sensitivity of passive measurements to light rain by leveraging radar data and measurements of raindrop distributions. This method may help to close the gap between global precipitation estimates at high latitudes and maximize the utility of passive sensors. 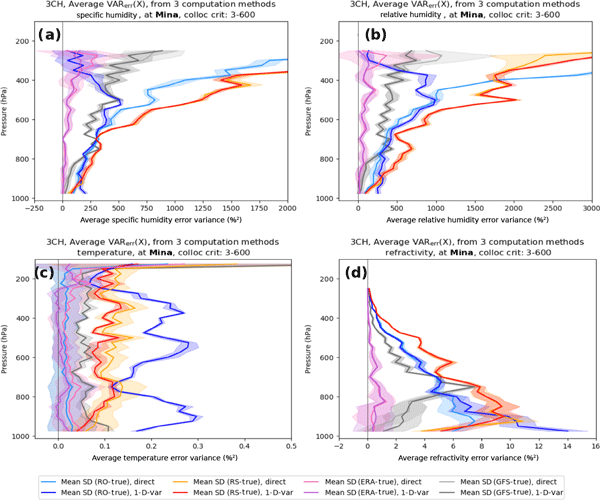 We show how multiple data sets, including observations and models, can be combined using the "N-cornered hat method" to estimate vertical profiles of the errors of each system. Using data from 2007, we estimate the error variances of radio occultation, radiosondes, ERA-Interim, and GFS model data sets at four radiosonde locations in the tropics and subtropics. A key assumption is the neglect of error correlations among the different data sets, and we examine the consequences of this assumption. This paper presents an innovative retrieval method that translates the CALIOP land surface laser pulse returns into the surface bidirectional reflectance. 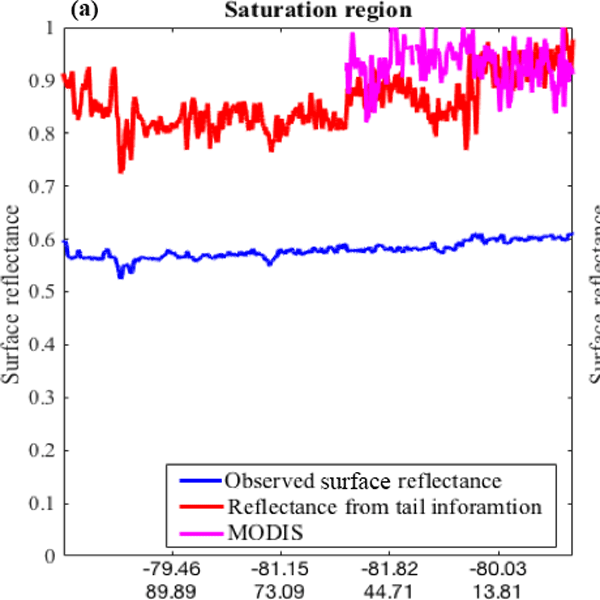 The surface bidirectional reflectances retrieved from CALIOP measurements contribute complementary data for existing MODIS standard data products and could be used to detect and monitor seasonal surface reflectance changes in high latitude regions where passive MODIS measurements are limited. Estimating snowfall intensity from satellite and ground-based radar missions requires accurate retrieval models. Reflectivity–snowfall relations are obtained at cm and mm wavelengths using data recorded during the Biogenic Aerosols Effects on Clouds and Climate (BAECC) campaign in Finland. Lightly, moderately and heavily rimed snow cases are identified. Numerical simulations are performed to relate snowflake microphysical (video disdrometer) and multifrequency backscattering properties (radars). OH*-spectrometer measurements allow the analysis of gravity wave ground-based periods, but spatial information cannot necessarily be deduced. We combine the approach of Wachter at al. (2015) in order to derive horizontal wavelengths (but based on only one OH* spectrometer) with additional information about wind and temperature and compute vertical wavelengths. Knowledge of these parameters is a precondition for the calculation of further information such as the wave group velocity. Atmospheric Infrared Sounder (AIRS) satellite observations are used to quantify the scale-dependent variance of temperature and water vapor in the atmosphere. The scale dependence is much more variable than previously thought, using a new methodology based on individual satellite swaths. A break in the scale dependence is found to vary from less than 100 to greater than 1000 km. These new variance scaling results are of high importance for improving climate GCM subgrid parameterizations. 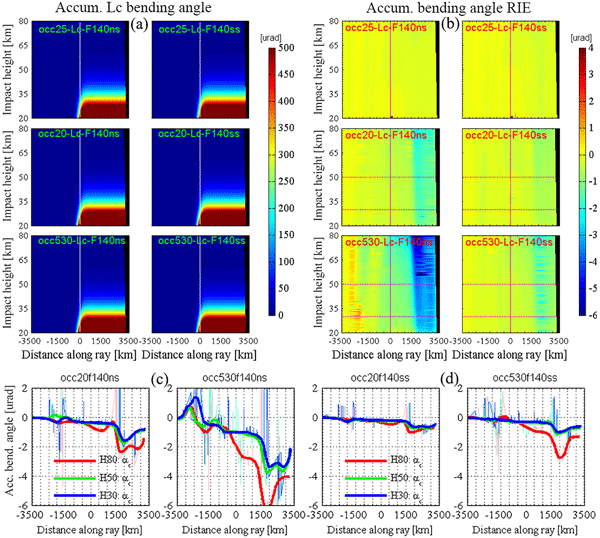 We process global navigation satellite system radio occultation (RO) observations in a new way with integrated uncertainty propagation; in this study we focus on retrieving atmospheric bending angles from RO excess phase profiles. We find that this new approach within our novel Reference Occultation Processing System (rOPS) exploits the strengths of RO such as its high accuracy and long-term stability in a reliable manner for global climate monitoring and other weather and climate uses. Residual calibration biases affecting CALIPSO IIR Version 1 calibrated radiances in the Northern Hemisphere are analyzed and reduced through in-depth analysis of the IIR internal calibration procedure in conjunction with observations such as statistical comparisons with similar MODIS/Aqua channels. 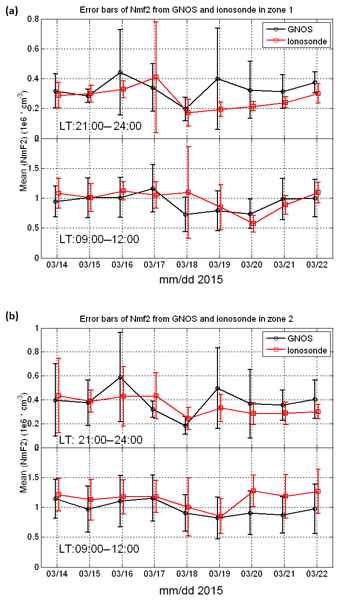 In this study, we focused on investigating the causes of the higher-order residual ionospheric error (RIE) in the GNSS RO events, by employing detailed along-ray-path analyses of atmospheric and ionospheric refractivities, impact parameter changes, and bending angles and RIEs under asymmetric and symmetric ionospheric structures. We found that the main causes of the high RIEs are a combination of physics-based effects, where asymmetric ionospheric conditions play the primary role. We focused on the measurements taken during the period of February 2014 to November 2017. The FTS instrument was stable during the whole measurement period. 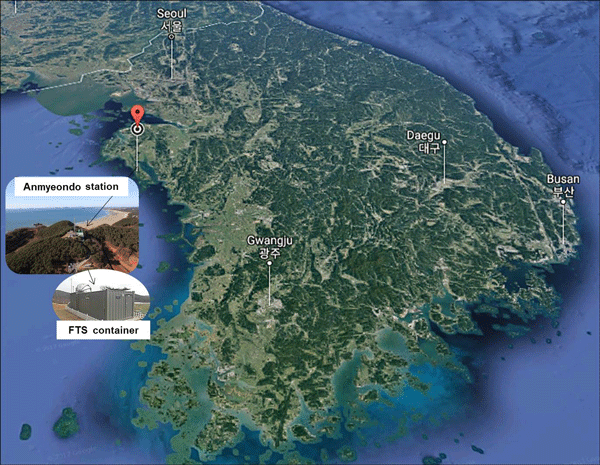 The g-b FTS retrieval of XCO2 and XCH4 were compared with aircraft measurements that were conducted over Anmyeondo station on 22 May 2016, 29 October, and 12 November 2017. The preliminary comparison results of XCO2 between FTS and OCO-2 were also presented over the Anmyeondo station. GPS radio occultation (GPS-RO) is a method of probing the atmosphere using GPS signals. Such measurements can be assimilated into operational numerical weather prediction (NWP) systems and can reduce stratospheric temperature biases. This indicates that they could have an important role in climate monitoring and climate reanalyses. However, the measurements must be corrected to account for the effects of the ionosphere and this paper proposes an enhanced correction that removes residual biases. Explosions in the atmosphere produce infrasound, recorded as very small pressure fluctuations. The relatively new infrasound technology also provides information on atmospheric dynamics. Within the ARISE2 project we have analysed the tidal variability using the data of the global IMS infrasound network. Our findings are compared with reanalysis data. We claim our methodology to be applicable for geographical and temporal studies of dynamic features and propose future applications. The refractivity in the radio occultation (RO) is generally obtained from the inverse Abel transform (AI) of measured bending angle. While concise and mathematically exact, AI is susceptible to the error present in the measurement. Aiming to reduce the adverse effects of the measurement error, this study proposes a new method for determining the refractivity through a variational regularization (VR). 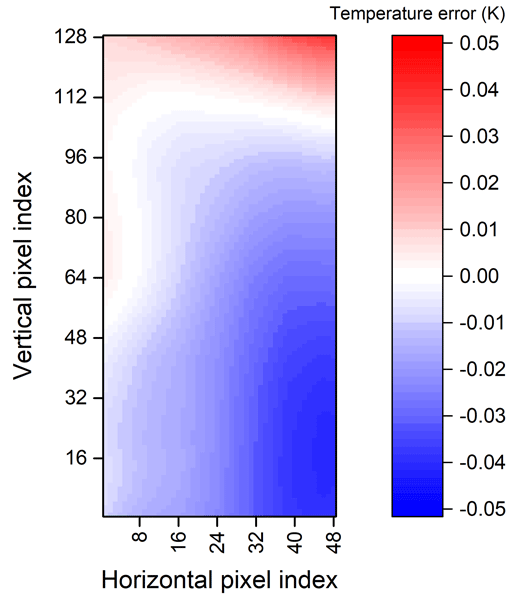 Verification shows that VR offers a definite advantage over AI in the quality of refractivity. It is shown that during a satellite-to-satellite radio transmission, over the Earth's limb, the signal bounced off the ocean contains information of the low atmosphere as shown with radio occultations. This bounced signal is particularly clear over colder oceans but less clear over the tropics. This information is indicative of the properties of the low troposphere and can be used as a remote sensing measurement for weather. This work is based on previous findings from our group of researchers, regarding the analysis of atmospheric data from slanted soundings during radiosoundings and GPS radio occulations. Several gravity wave climatologies may be found in the literature that to a certain extent are affected by considerable measurement distortions. We intend here to contribute to the interpretation of gravity waves analyses from slanted soundings in future climatologies. Tropical atmospheric variability is often described using proxy indices of the Quasi-Biennial Oscillation and the El Niño–Southern Oscillation. We introduce new proxies derived from GNSS radio occultation (RO) satellite measurements. Using the high vertical resolution of the RO temperature fields we obtain altitude-resolved indices which can improve the description of atmospheric variability patterns and can be used in climate studies where a detailed knowledge of these patterns is required. 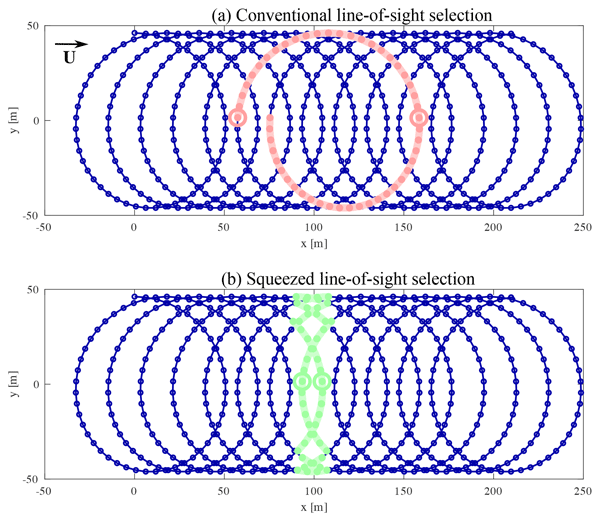 We apply linear and non-linear representations of wave fields, based on Fourier integral operators and Wigner distribution function, to the retrieval of reflected rays from radio occultation observations. We introduce a reflection index that characterizes the relative intensity of the reflected ray. A comparison of indices evaluated for a large base of events including the visual identification of reflections indicated a good agreement with our definition of reflection index. In this study we focus on evaluating zero-difference processing of BDS RO data vs. single-difference processing. From the statistics, average bias (and standard deviation) of the bending angle and refractivity profiles were found to be as small as about 0.05–0.2 % (and 0.7–1.6 %) over the upper troposphere and lower stratosphere, including for the GEO, IGSO, and MEO subsets. Zero differencing was found to perform slightly better, as may be expected from its lower vulnerability to noise. A new generation of the Infrared Atmospheric Sounding Interferometer (IASI) sounders, whose highly accurate measurements are commonly used in environment applications, has already been designed: IASI New Generation (IASI-NG). A database of IASI and IASI-NG simulated observations was built to set a common framework for future impact studies. This first study showed the IASI-NG benefit with an improvement of the temperature retrievals throughout the atmosphere and a lower benefit for the humidity. We discuss the relationships that link the observed fluctuation spectra of the amplitude and phase of signals used for the radio occultation sounding of the Earth's atmosphere with the spectra of atmospheric inhomogeneities. We demonstrate that the main contribution into the radio signal fluctuations comes from the internal gravity waves. These results may serve as the basis for the global monitoring of the wave activity in the stratosphere and upper troposphere. This research makes an application of the multifrequency technique (RIM) to the spectral analysis (frequency domain) for both atmospheric and precipitation, especially for precipitation echoes. Various precipitation conditions such as stratiform and convective precipitations were investigated with RIM for the first time. The effectiveness and potential capabilities of RIM in resolving small-scale precipitation and atmosphere structures have been verified by conditional averaging analysis. 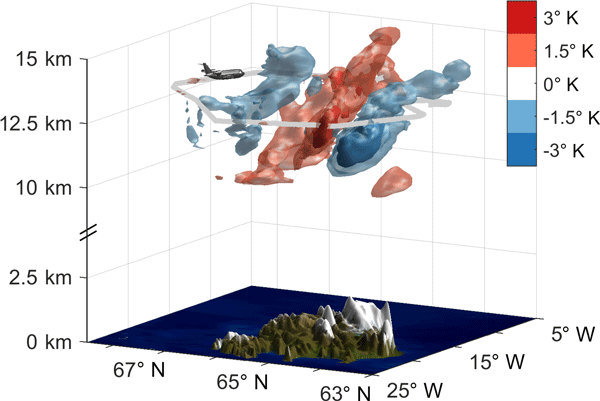 Many limb sounder measurements from the same atmospheric region taken at different angles can be combined into a 3-D tomographic image of the atmosphere. Mathematically, this is a complex, computationally expensive, underdetermined problem that needs additional constraints (regularisation). We introduce an improved regularisation method based on physical properties of the atmosphere with a new irregular grid implementation. Simulated data tests show improved results and lower computational cost.